It’s not surprising that Jeannie Spiro was a good interviewee: she teaches people how to be better speakers. We had fun and got great insights into creating and delivering a Signature Talk. Jeannie says “People need to hear part of themself in your story” and we couldn’t agree more: that’s a key to attracting your Ideal Clients. We talked about how almost every business interaction can be viewed as a speaking opportunity, from networking to podcasts. 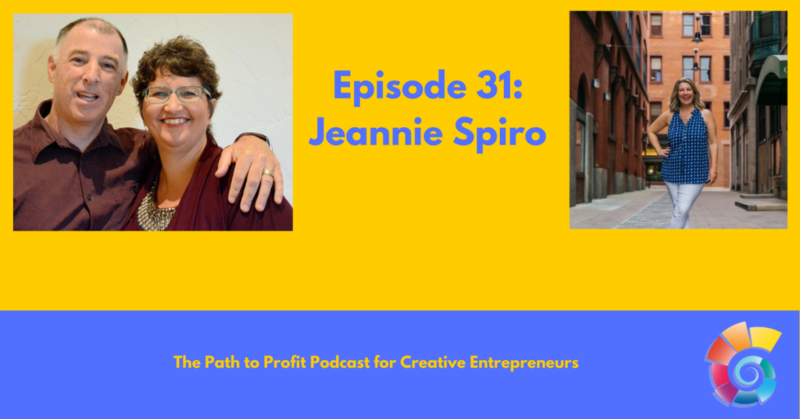 Known for her insightful, authentic and engaging approach, Jeannie Spiro is a top-notch speaker, sales strategist, and business coach. She teaches coaches, consultants, and service-based entrepreneurs how to deliver an engaging Signature Talk, close sales conversations without feeling pushy, and generate consistent revenue. Having earned six figures in just 12 months as a result of speaking and selling her coaching packages, Jeannie is passionate about sharing her proven formula with others so that they can build equally fulfilling and lucrative lifestyle businesses. With over 20 years’ experience working and delivering sales presentations for brokerage firms and Fortune 500 companies, such as Blue Cross and United Healthcare, Jeannie once grew a sales division to several hundred thousand dollars and has extensive experience managing and mentoring sales teams. Since leaving Corporate America, Jeannie has put her degree in Speech Communication to good use. She has spoken at live events such as Elevate LIVE, Screw Networking as Usual, and the Association for ADHD Coaches’ National Conference; been interviewed on podcasts including Interview Connections, The Boomer Business Owner, Courageous Heartbeats, Paycheck to Passion, Rhodes to Success, and The Advancing Entrepreneur; and been featured by AliBrown.com, Lioness Magazine, EntreprenHers, and others. ← Are These Self-Sabotaging Behaviors Impacting your Income?